Now that's a striking cover for Adrian Tchaikovsky's Heirs of the Blade by Jon Sullivan. I generally prefer UK art to US art on fantasy books. More's the pity since I live in the US. That's not so bad, though it looks like it still uses this latest trend of basing the art around a photo. pat: even more good news apparently pyr will continue to publish the series here. how do I know this. i've spotted the US cover for THE SCARAB PATH at a blog called stomping on yeti. 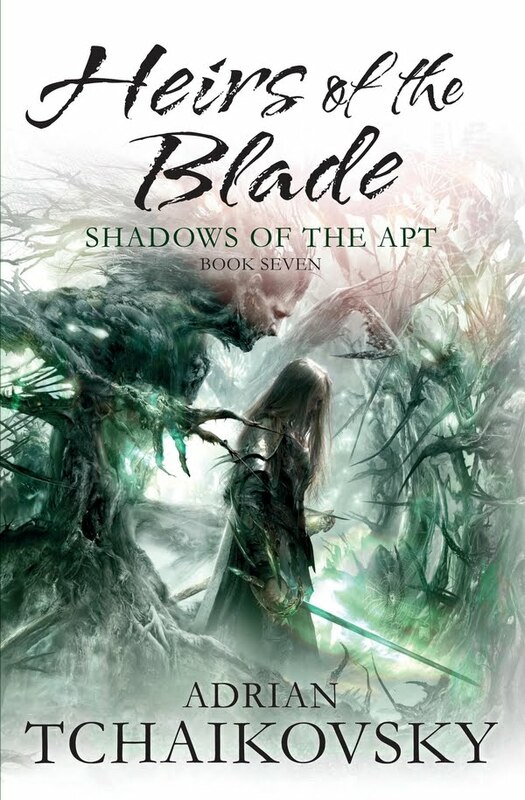 the guy looks a lot like Sephiroth imo, but it's a really cool cover anyway. The Scarab Path was really good and continued this really well written series. I'm looking forward to The Sea Watch. I hope it comes out in the US again for cheap on the kindle but I'm thinking that won't happen anymore. Looks nice, the UK covers are getting much better for this series, almost on par with what Pyr has done. TED CROSS: I dunno where the photo element comes from? Looks all painted to me. ANON: that's a chick on the cover, not a dude - if you've read the books you'd be able to guess who. I'm totally loving this series, especially how they're being released regularly and quickly.